We start with an assessment of the floor to see if there are lose tiles or grouting that needs to be resealed. 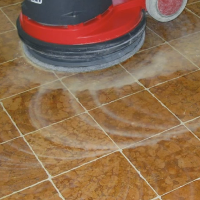 Then, we apply our bespoke cleaning formulas over and between the tiles. 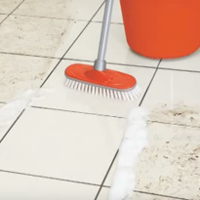 We give the tiles and grout a thorough scrub, using non-abrasive pads and brushes to prevent scratches. During the cleaning, we make sure to cover the grout line and any stained areas. After the good scour, we blast away the grime with a high-pressure spinner for the most polished look that can be achieved. Finally, we rinse and mop the floor. It’s now safe for the pitter-patter of tiny and not so tiny feet. no extra charges for weekends and public holidays.